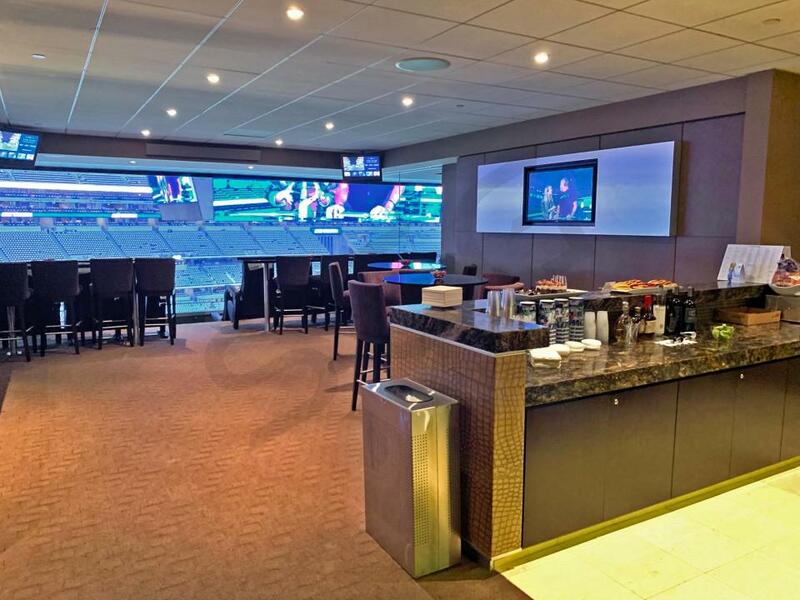 How much do Big 12 Football Championship Game suites cost? 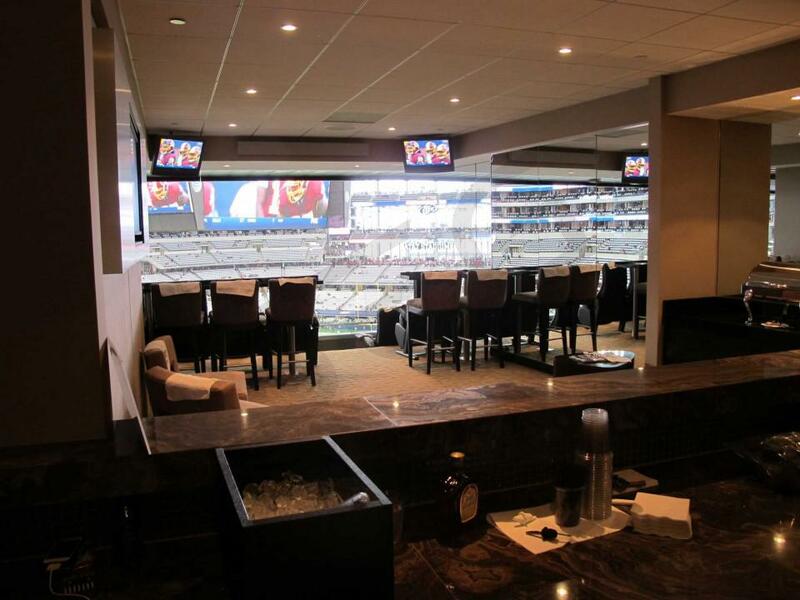 Suites for the Big 12 college football championship game at AT&T Stadium are priced between $11,000 - $35,000 on average. Pricing for the Big 12 championship will vary the most based on the location of your luxury box. 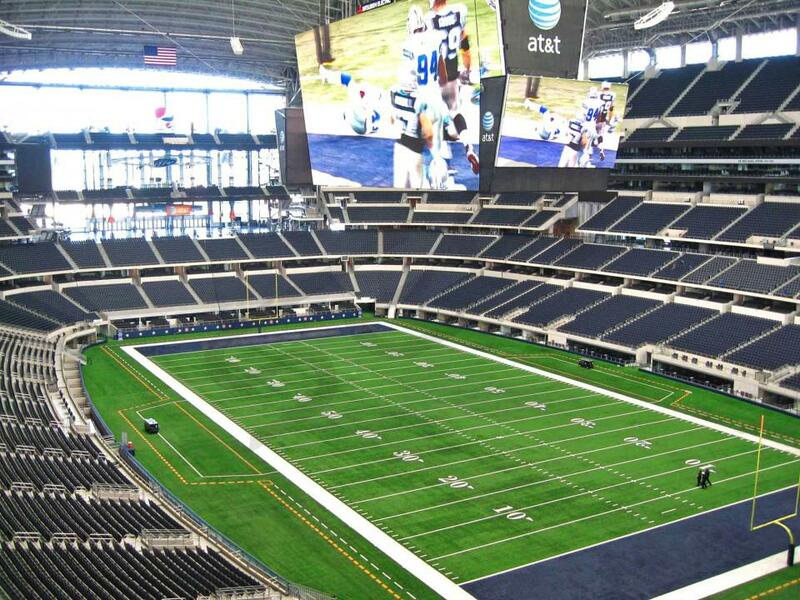 The most expensive suites for the Big 12 Championship will located on the Hall of Fame level at AT&T Stadium. 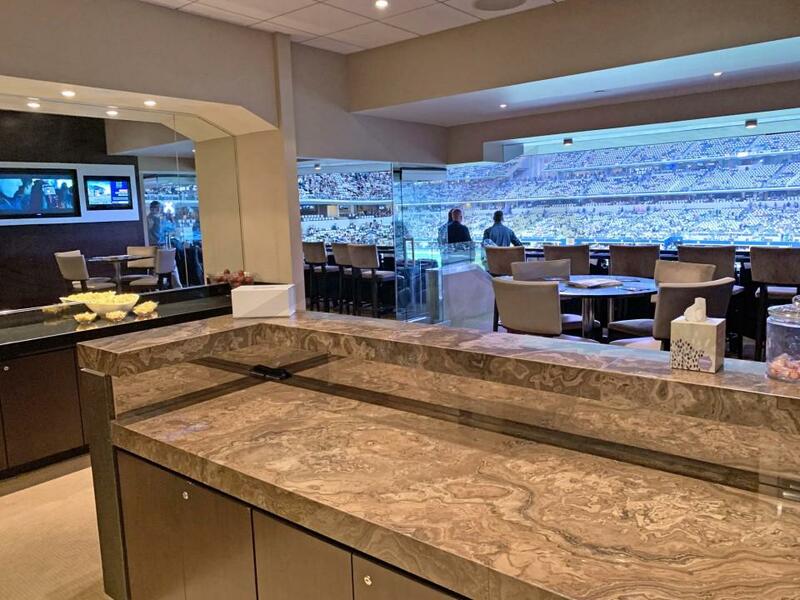 Field Level Suites make for one of the coolest experiences in professional sports, bringing you within feet of the action on the field. 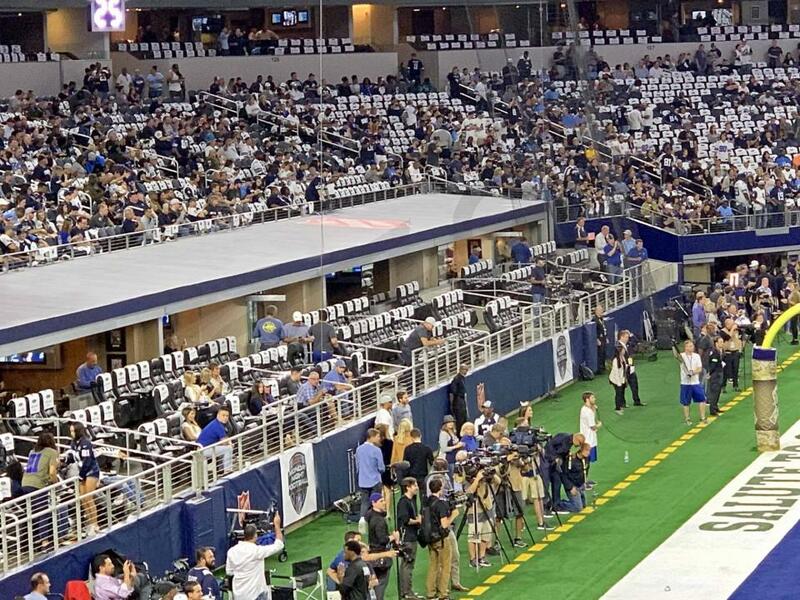 At AT&T Stadium, there are 34 Field Suites running along both sidelines. 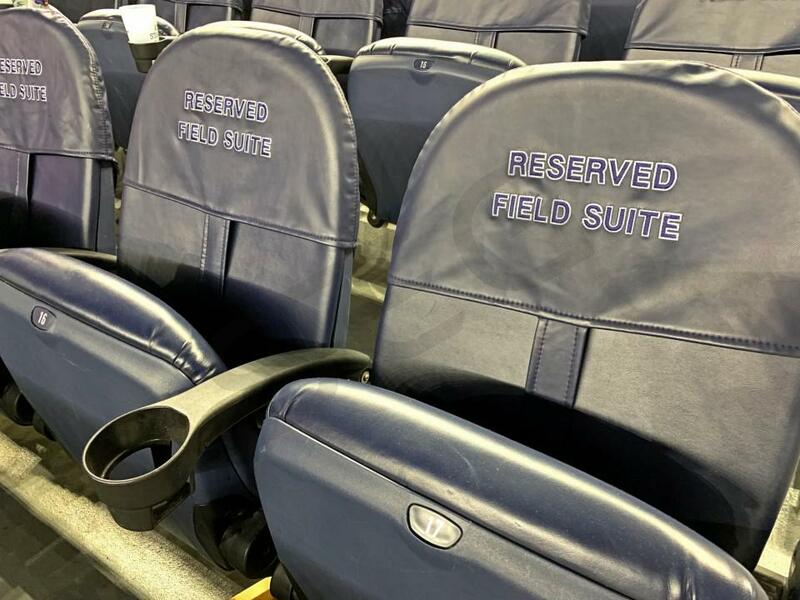 Field Level Suites consist of an open-air standing room patio on the field, just feet in front of a private enclosed suite. Guests are able to walk freely between the two areas. 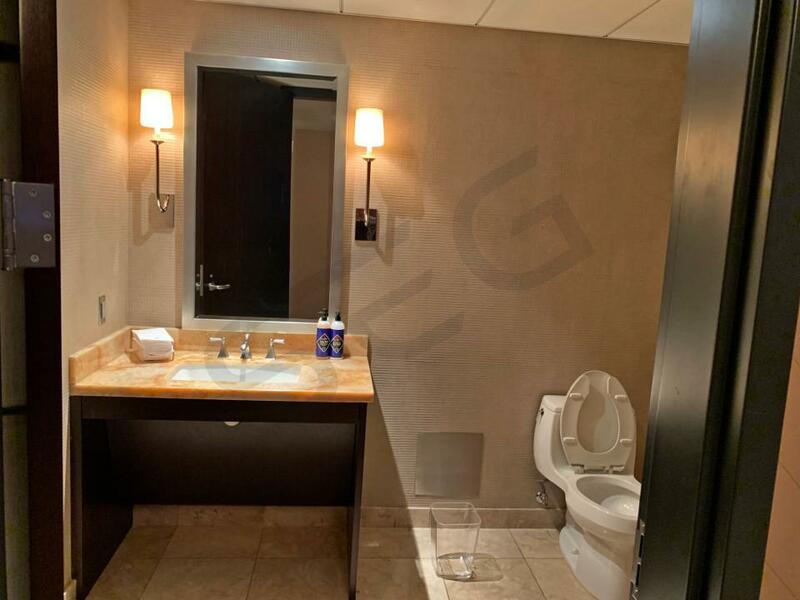 The enclosed portion of the suite features traditional suite amenities such as lounge seating, bar/kitchenette area, HDTV's, and a private restroom. All Event Level Suites will come with VIP parking and access to the DraftKings Club, an upscale lounge area under the stadium where the players enter/exit the field. 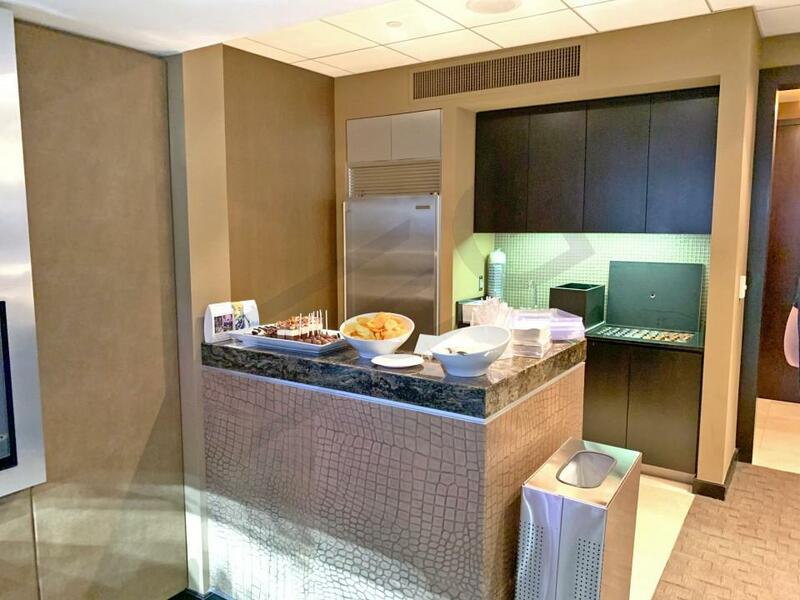 All suites come with the option to purchase premium in-suite catering. 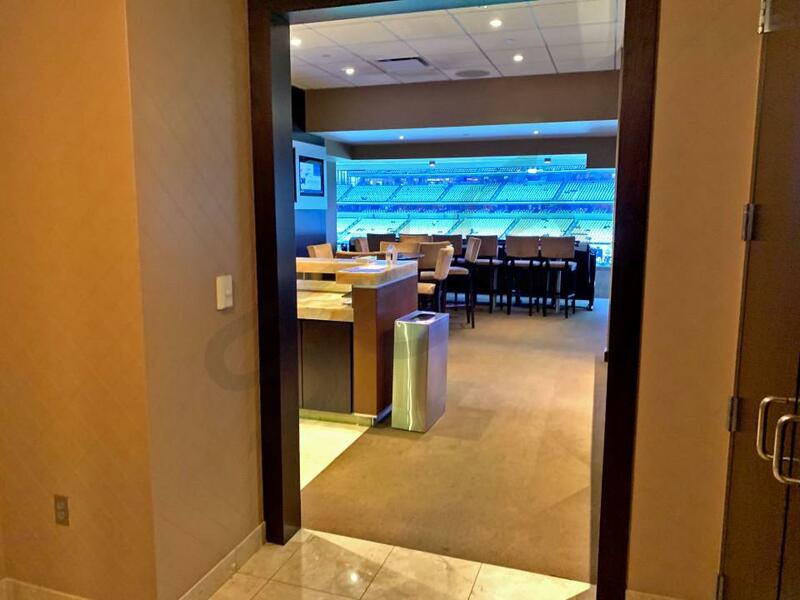 Hall of Fame Suites are located just above the 100 level providing a fantastic vantage point to the field. 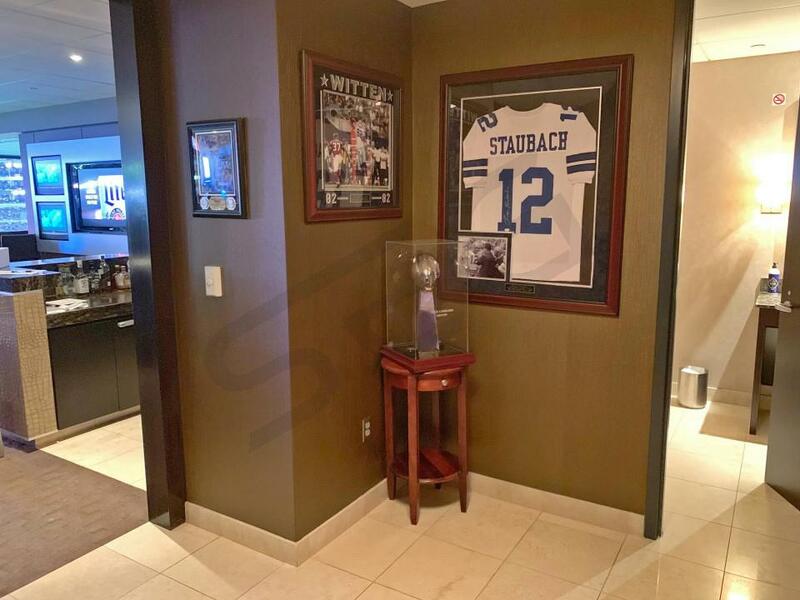 The Hall of Fame suite level is the generally the most prestigious suite level at AT&T Stadium. 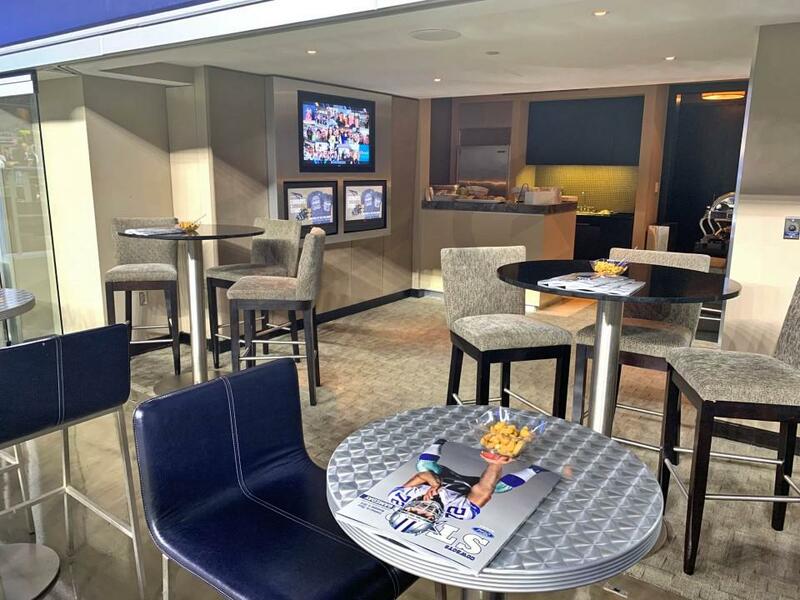 A Hall of Fame suite includes interior and exterior seating with two rows of plush leather stadium seats facing the field on an open-air balcony. Hall of Fame suites are luxuriously furnished including HDTV's, a spacious bar/kitchen area, lounge seating, and a private in-suite restroom. 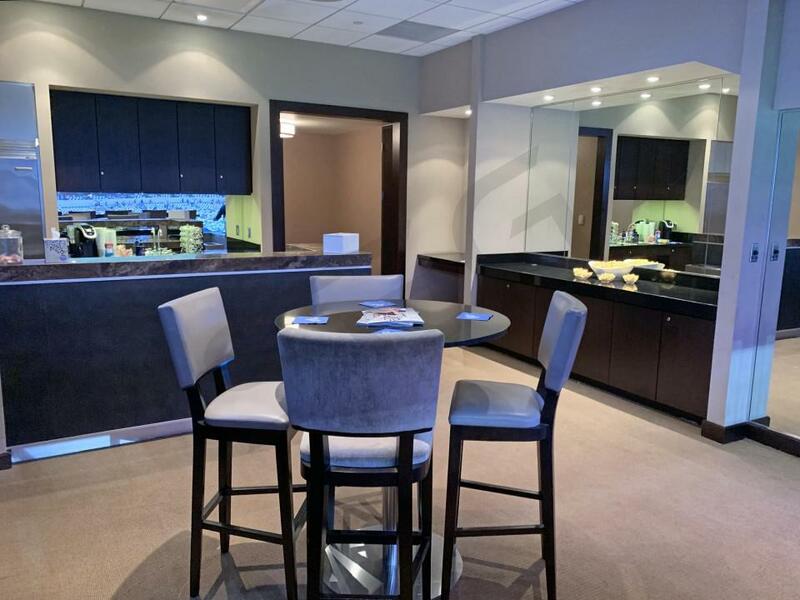 Suites come with VIP parking and the option to purchase in-suite catering. Hall of Fame suites include typically include 12 - 20 tickets with an option to purchase up to 8 - 10 additional suite tickets. 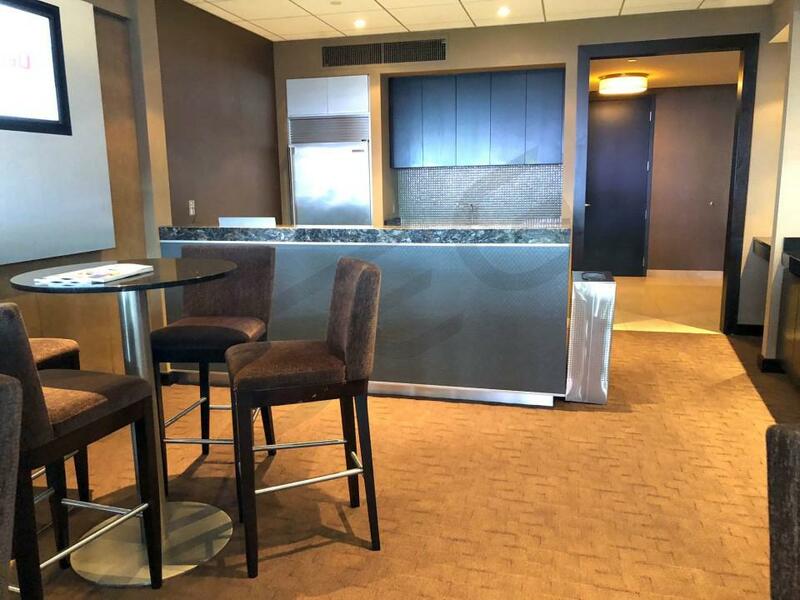 Silver Level Suites occupy the largest suite level at AT&T Stadium. 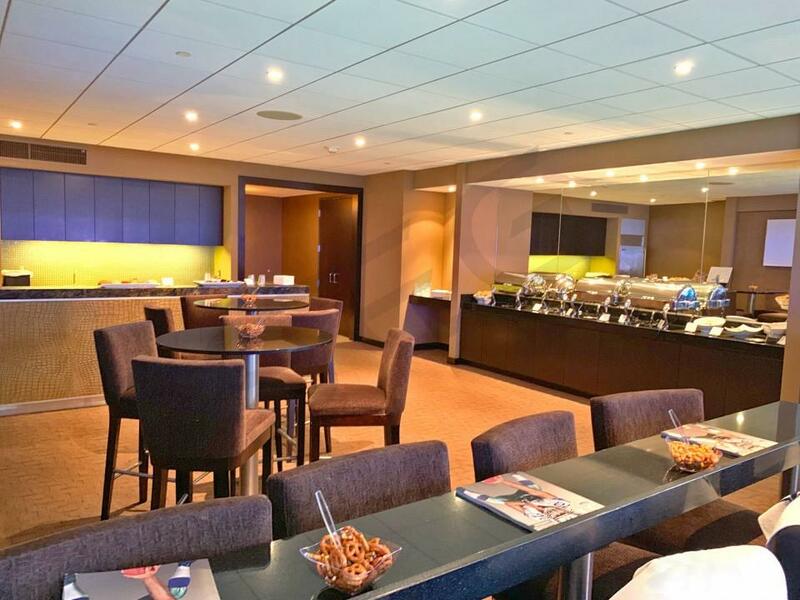 In total, the Silver Suite Level contains 88 private suites wrapping around the entire stadium. 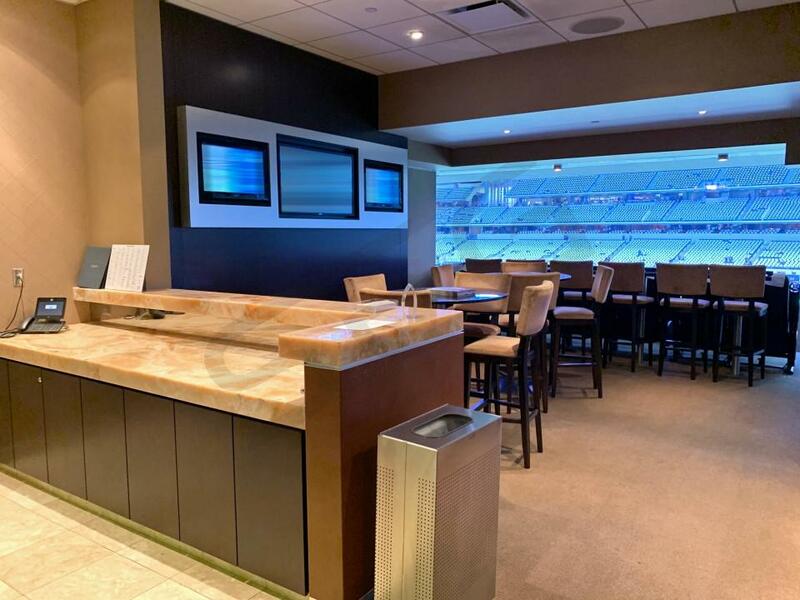 The Silver Suite Level is located just above the 300-level seating sections and is the third suite level from the field. Silver suites include 18-20 tickets with the option to purchase up to 10-12 additional tickets. Silver Suites are great value in terms of price and viewing experience. 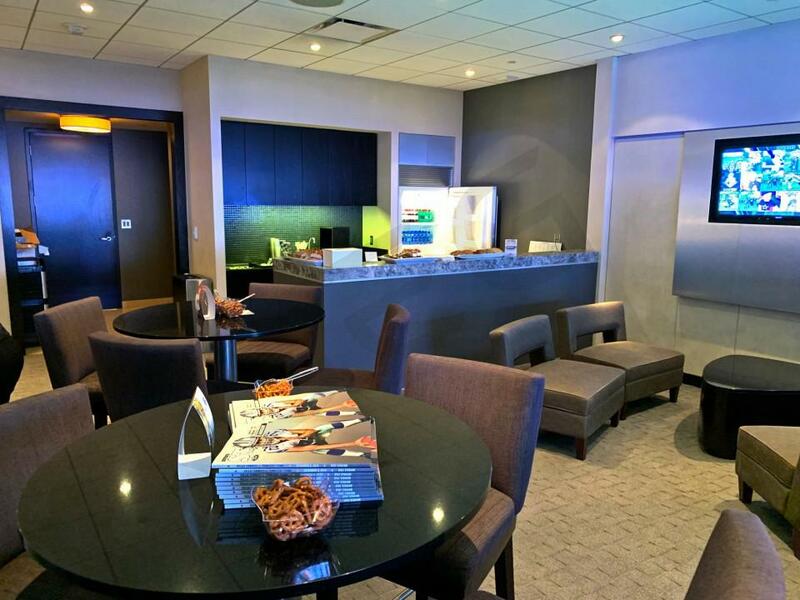 Suite amenities include interior and exterior seating, HDTV's, bar/kitchen area, a private restroom, and the option to order in-suite catering. Silver suites will also come with VIP parking passes. 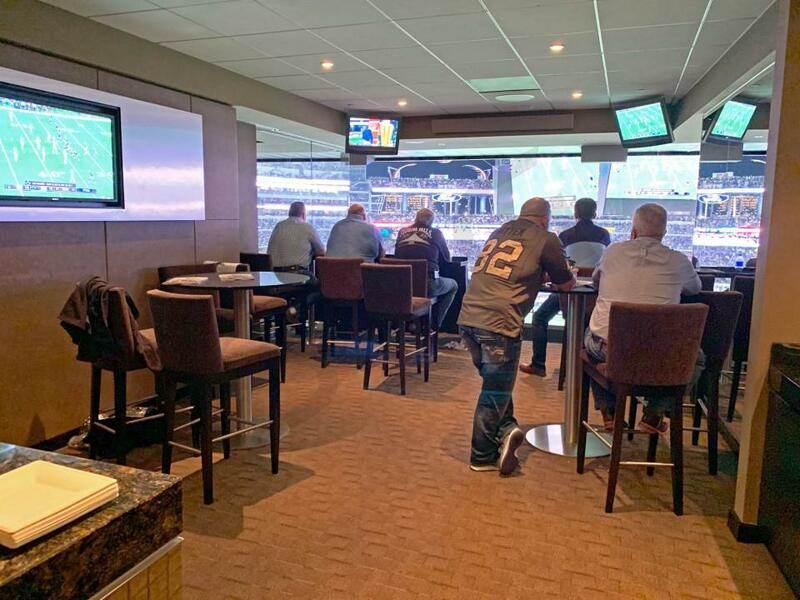 The Ring of Honor suite level is stacked on top of the Silver suite level and is the fourth suite level from the field at AT&T Stadium.These suites generally accommodate 18-30 guests. 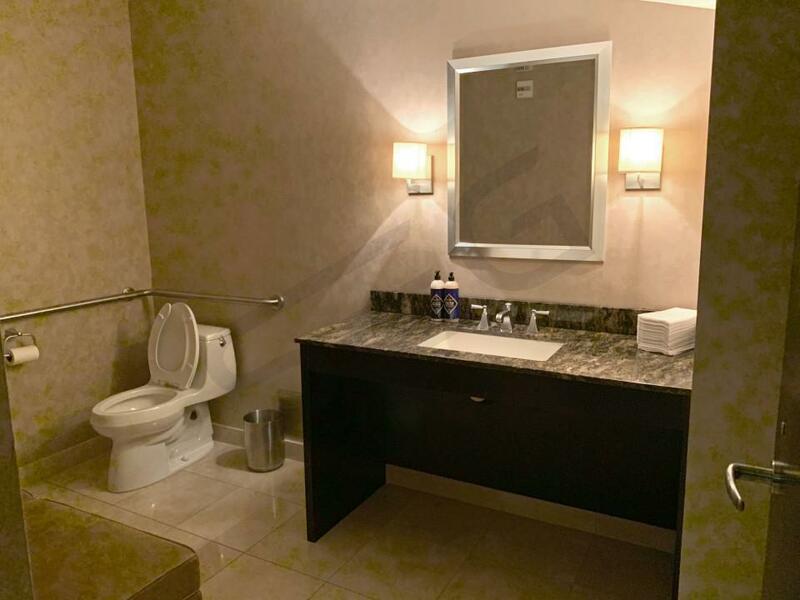 Suite amenities include high-end furnishings, interior and exterior seating, HDTV's, a private bar/kitchen area, private restroom, and the option to order in-suite catering. Ring of Honor suites will also come with an allotment of VIP parking passes. 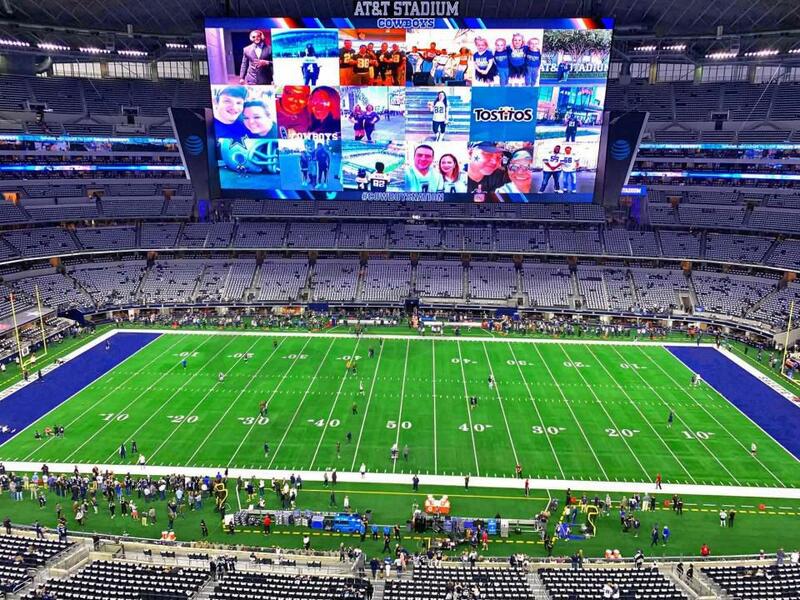 The Star Level is the highest suite level at AT&T Stadium providing a great birds-eye view of the field. 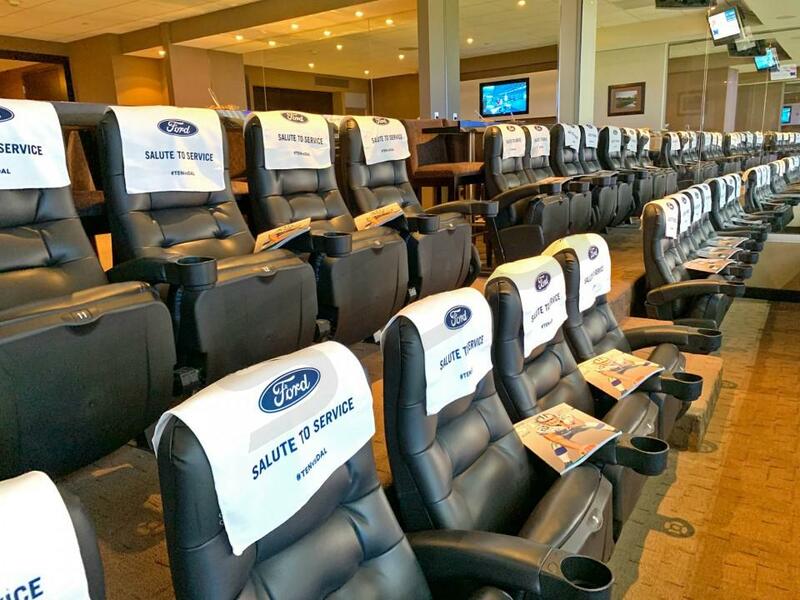 Star Level suites generally include 18 tickets with an option to purchase up to 12 additional tickets. 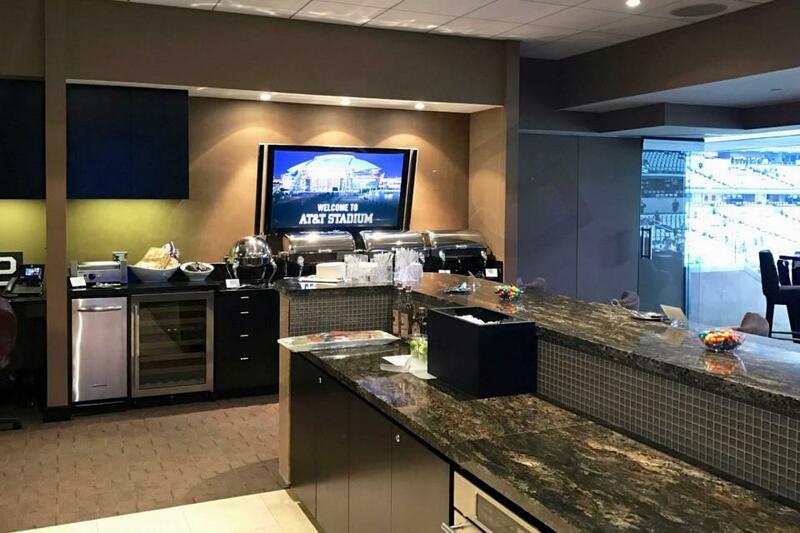 Star Level suites include interior and exterior seating, HDTV's, bar/kitchenette, a private restroom, and the option to order in-suite catering. 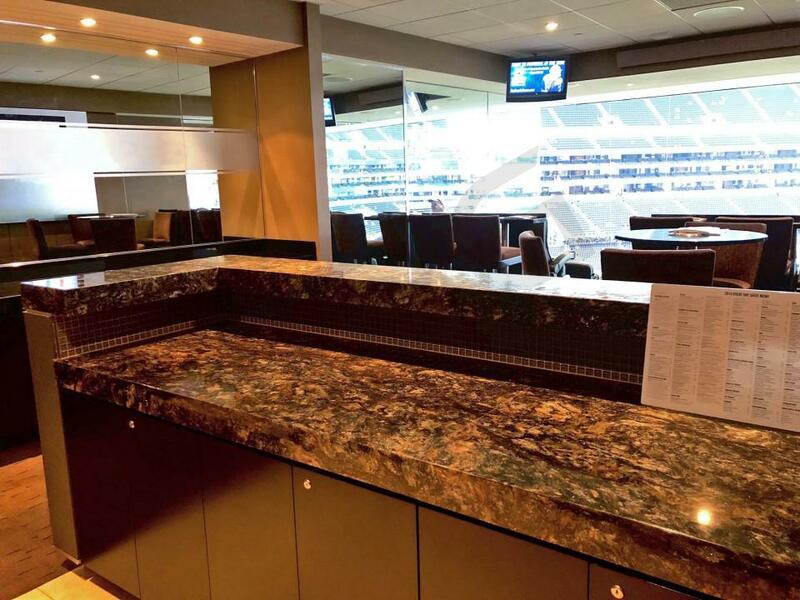 AT&T Stadium Owner's Club suites are located on the Hall of Fame level just 21 rows up from the field. 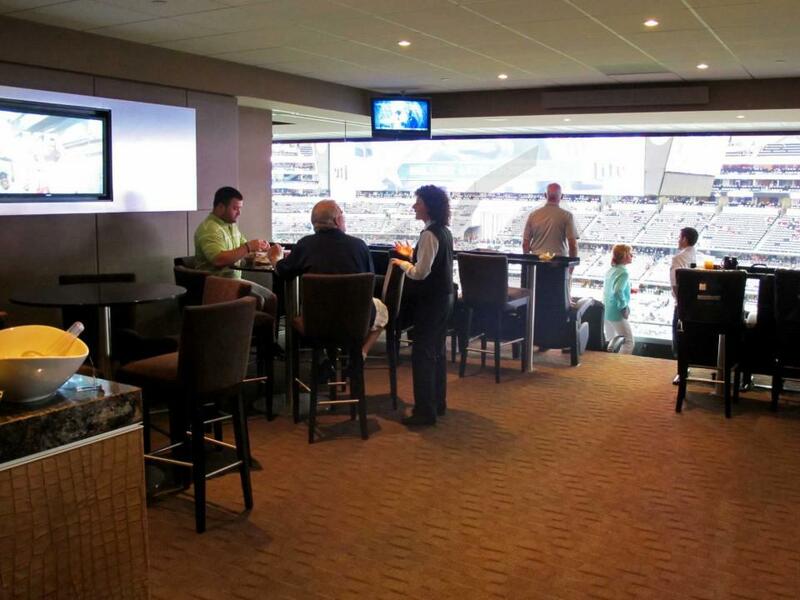 Owner's Club suites are all-inclusive food and beverage, including alcohol. 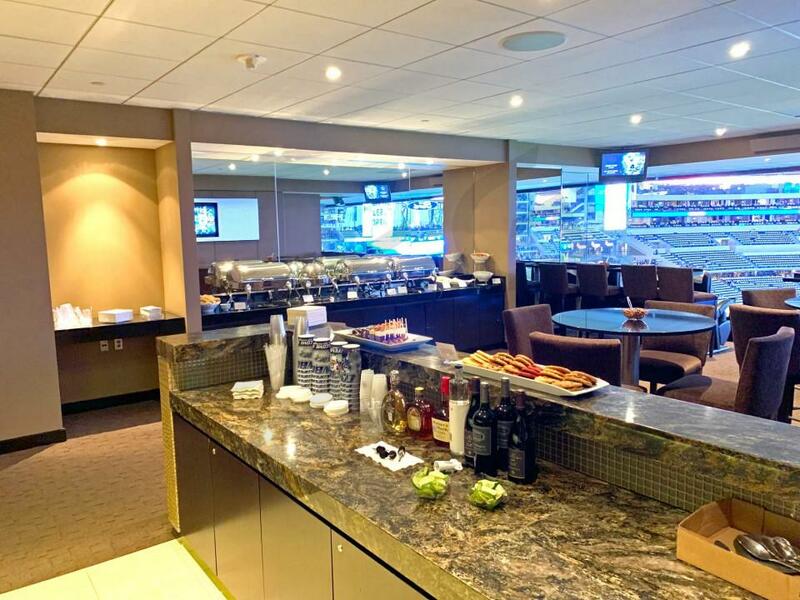 All Owner's Club suites share a private hospitality area where there's open bars and buffets available. 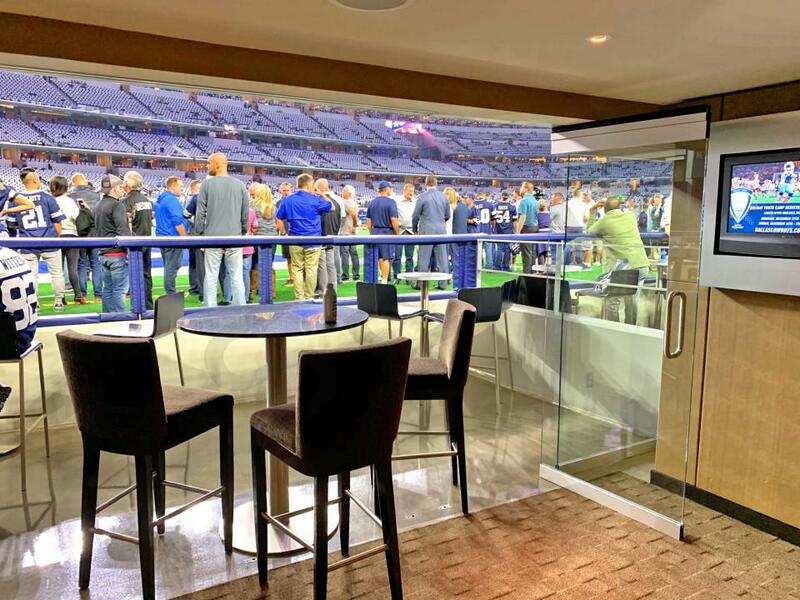 Cowboys' owner, Jerry Jones, has his personal luxury suite located within the Owner's Club. Private entry and VIP parking passes are included with your suite rental. 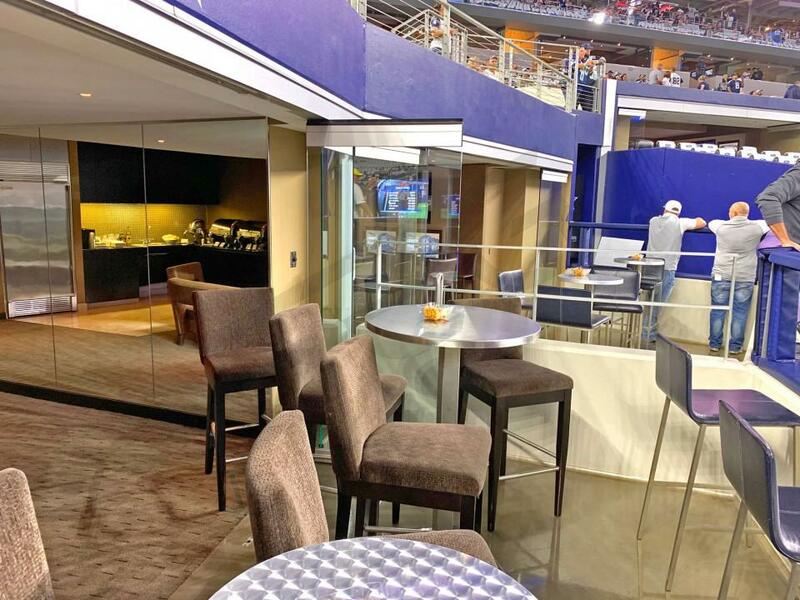 Touchdown suites are located behind each end zone, slightly elevated above the playing field. 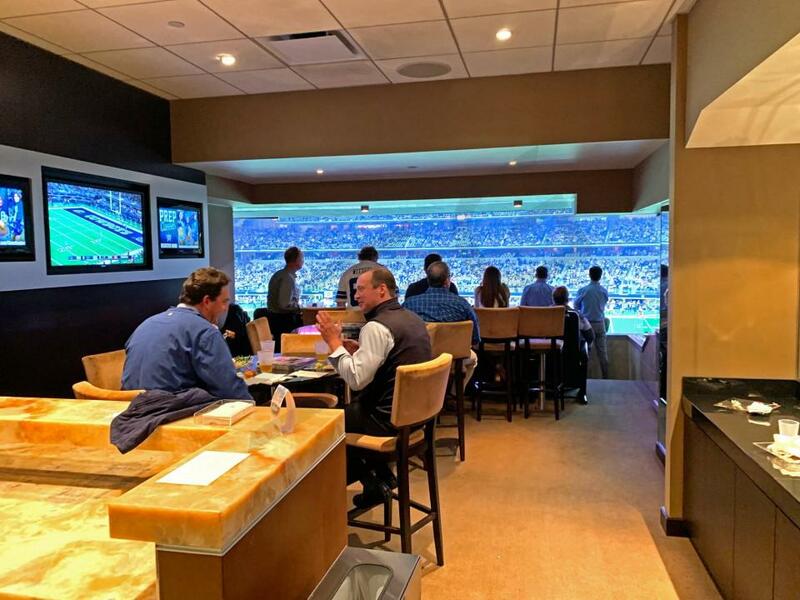 The slight elevation of Touchdown suites provides the ultimate viewing experience; a great vantage point to view the game while simultaneously feeling apart of the action on the field. 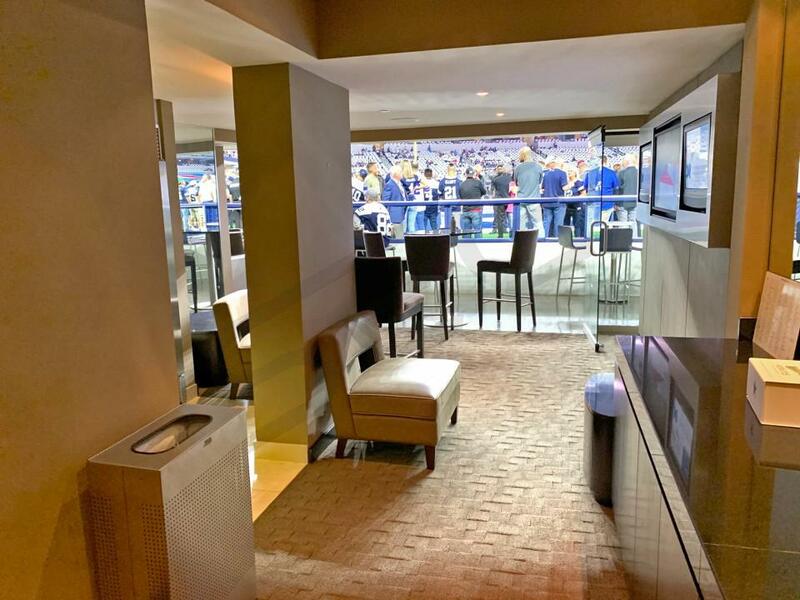 Touchdown suites include interior and exterior seating, notably two rows of plush leather stadium seats facing the field on an open-air balcony. 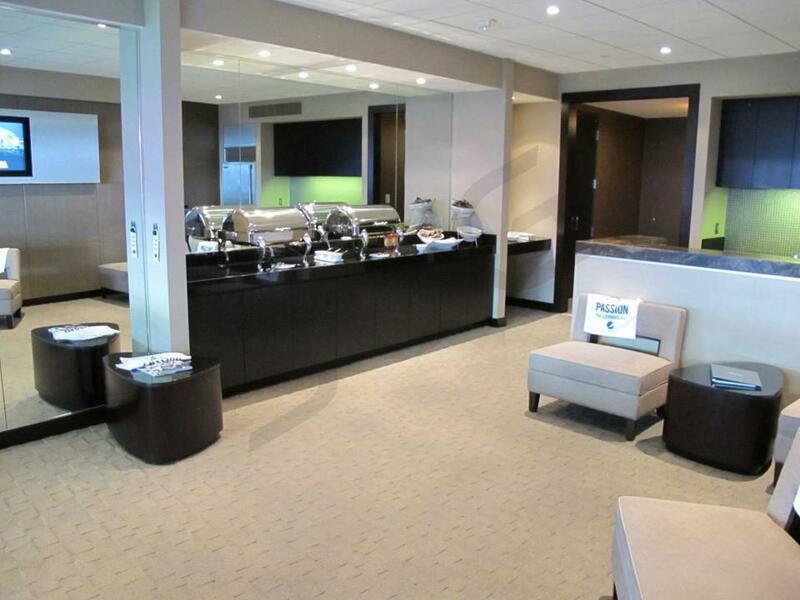 The enclosed area of Touchdown suites will include private restrooms, HDTV's, and a spacious bar/kitchenette area. 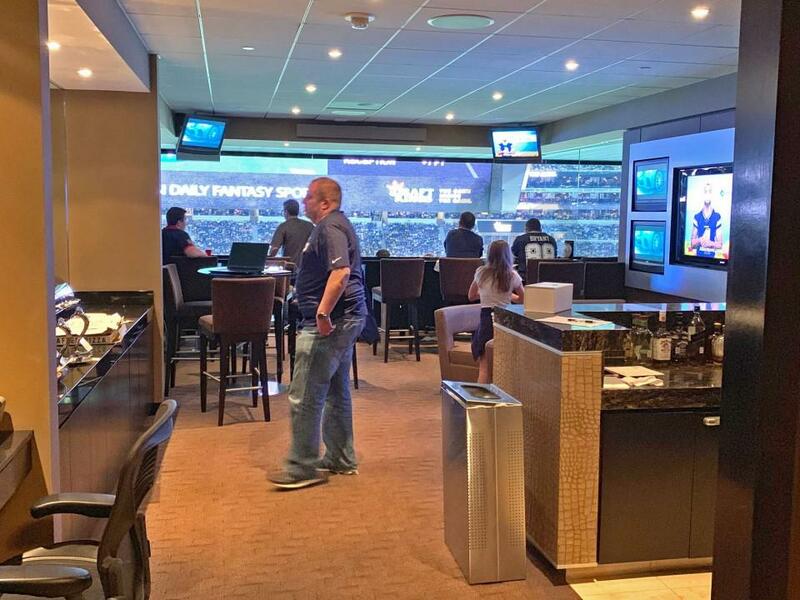 Touchdown Suites also provide guests with access to the DraftKings & Miller Lite Field Level Clubs where the players enter/exit the field. 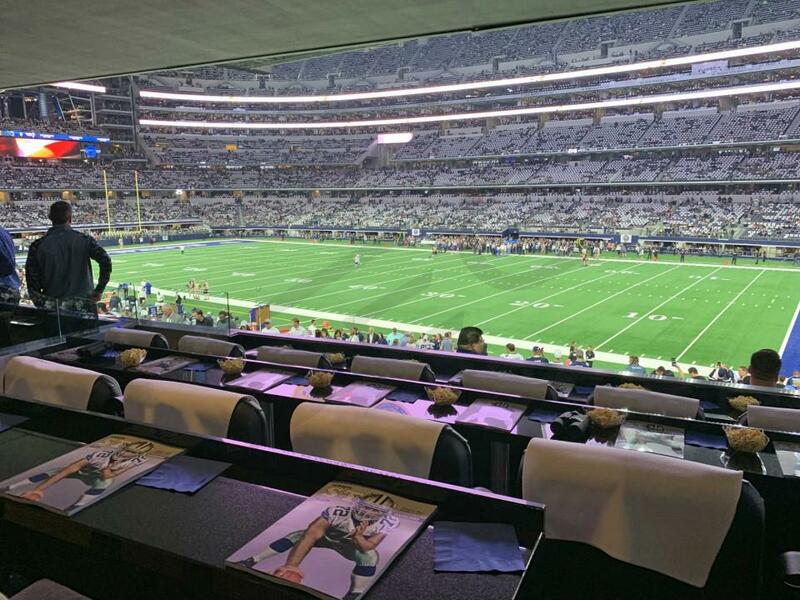 Suites at AT&T Stadium vary in size and configuration, typically by suite level. 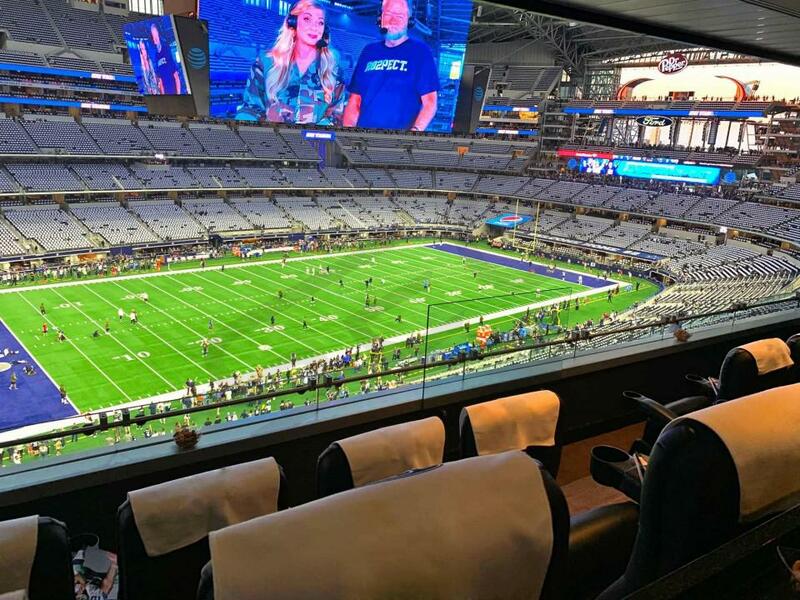 The smallest suites at AT&T Stadium have 12 fixed seats and 6 bar stools, with the option to purchase up to 12 additional standing-room only (SRO) suite tickets for a maximum capacity of 30 guests. The largest suites have 28 field-facing fixed seats and can max out at a 40-person capacity including the SRO tickets. 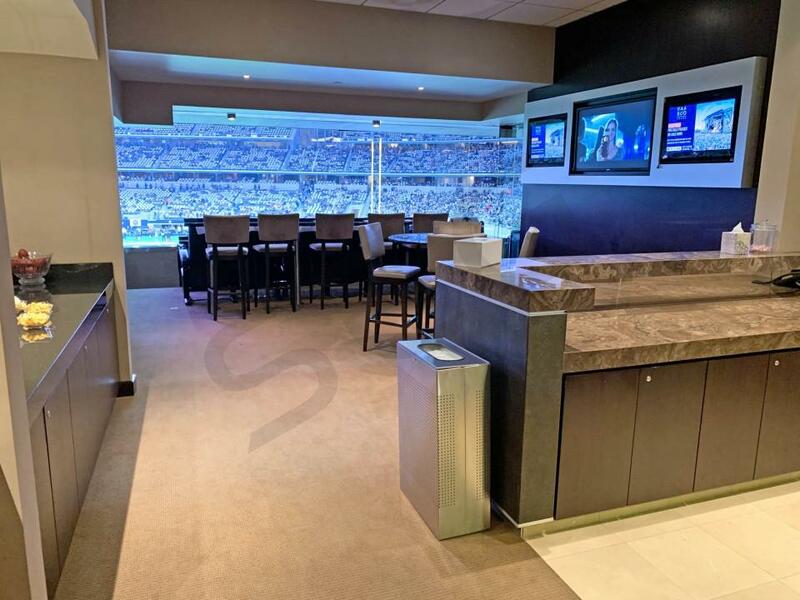 The most common layout for a suite at AT&T Stadium is 12 fixed seats facing the field and 6 high-top barstools also facing the field (with a counter-top where guests can place food and drinks). There is additional interior seating in the suite that usually seats an additional 4 to 6 guests. You typically have the option to purchase at least 10 SRO passes to supplement the fixed seats. 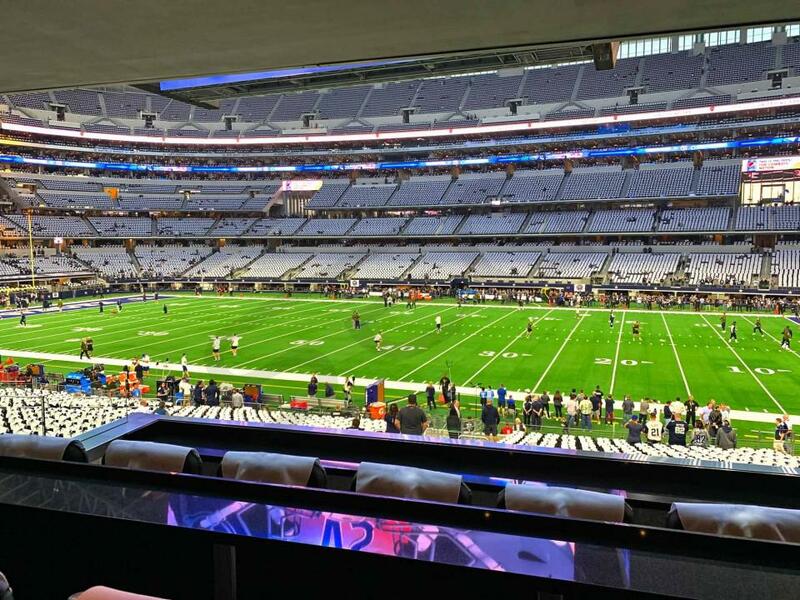 There is a wide range in suite prices at AT&T Stadium. 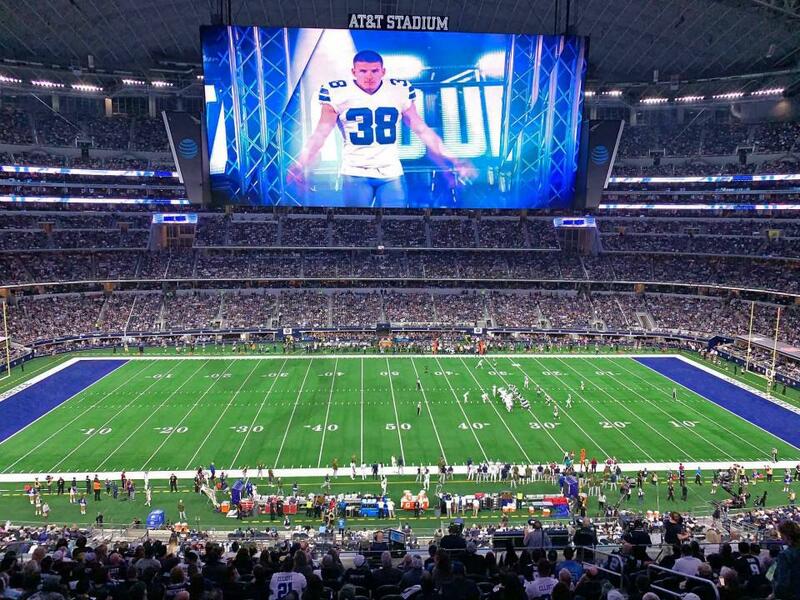 Third-party events such as Supercross, Monster Jam, or exhibition soccer games can start as low as $5,000 per suite, while a good suite location for the highest demand Cowboys games can be priced above $30,000 per game. 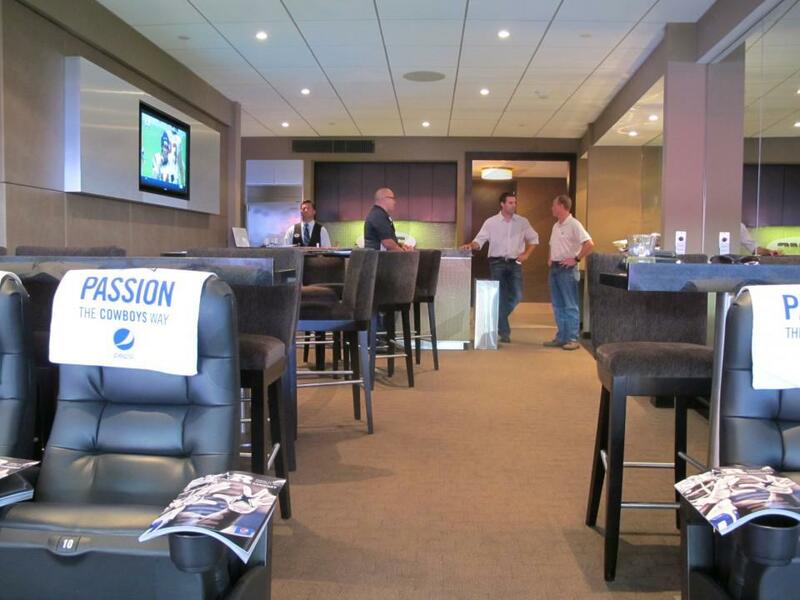 Suite Experience Group can help you determine which events will fit into your budget. 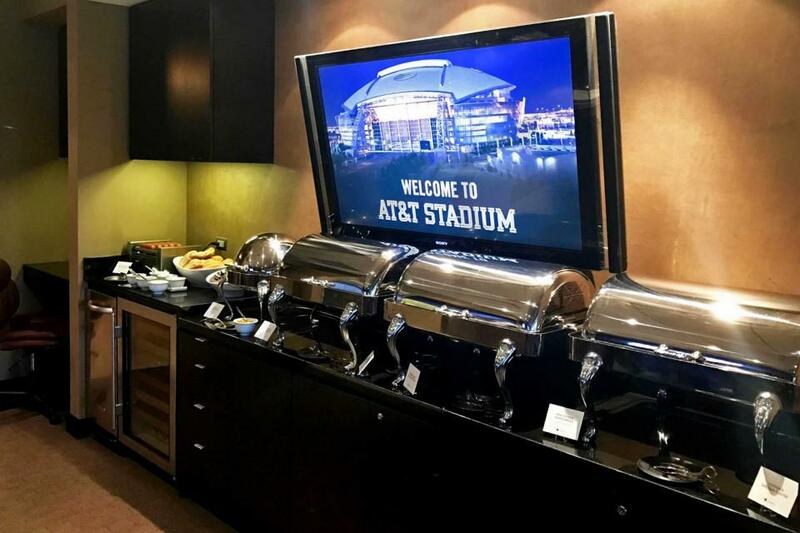 In-suite catering is available in all suites at AT&T Stadium. The menu includes a wide range of food and beverage options provided by Legends Catering. 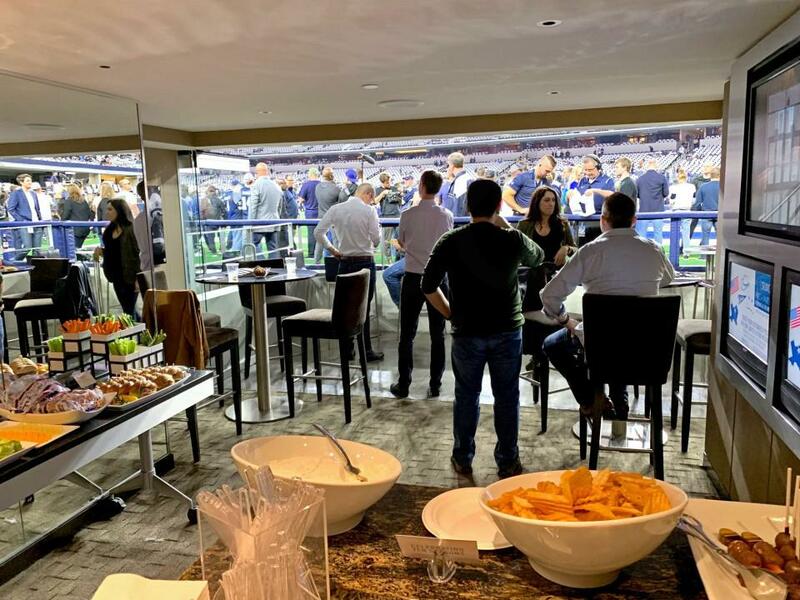 Most suites at AT&T Stadium do not include catering in the base price of the suite, so be sure to allocate additional funds if you would like to have your suite catered. 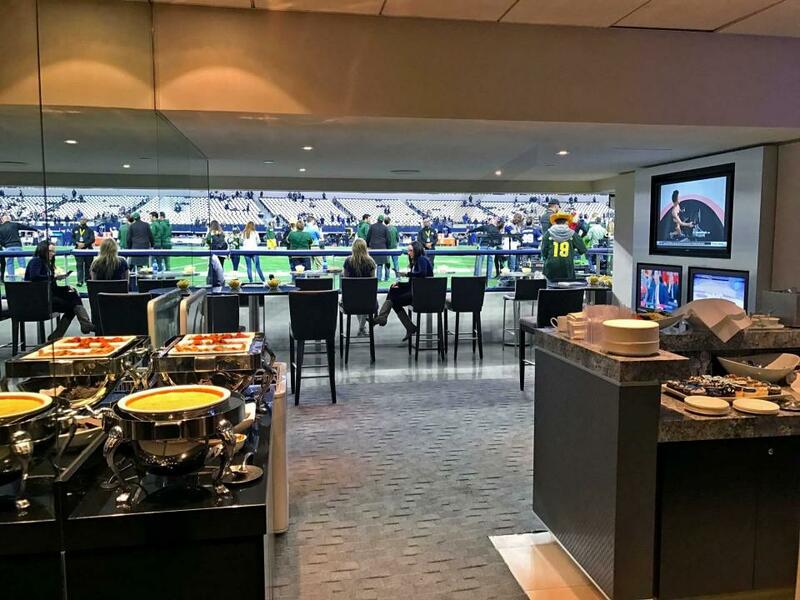 The average Suite Experience Group client at AT&T Stadium spends between $1,500 and $2,500 on in-suite catering. The bill can go even higher depending on the group size and the amount of alcohol consumed. 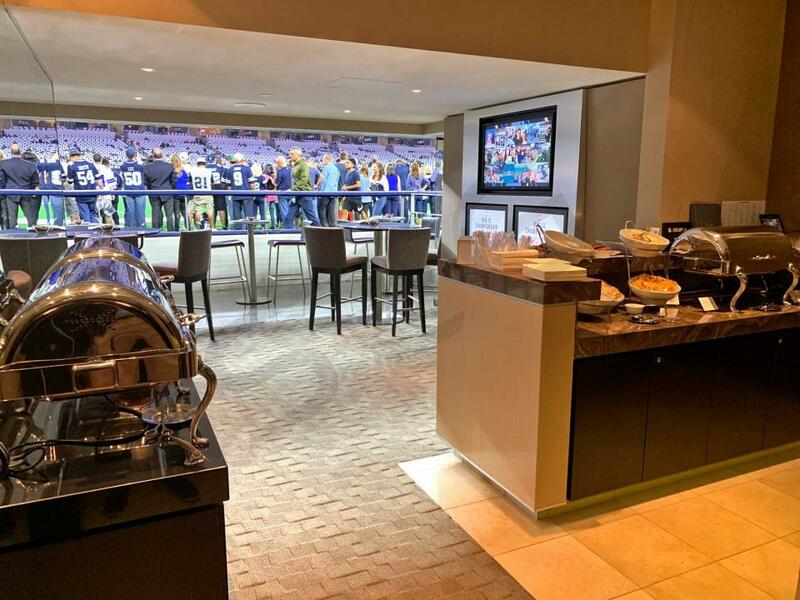 Suite Experience Group will provide an AT&T Stadium catering menu and can advise on the appropriate budget and catering order for your group. Star Club – this is the largest of the stadium clubs and it is centrally located on the main level, separating the party decks, and is accessible to all suite ticket holders and many club seat holders. Food and drinks in this club must be purchased unless you have an all-inclusive club seat ticket, in which case, you gain admission to a special ‘all you can eat’ area within the club. 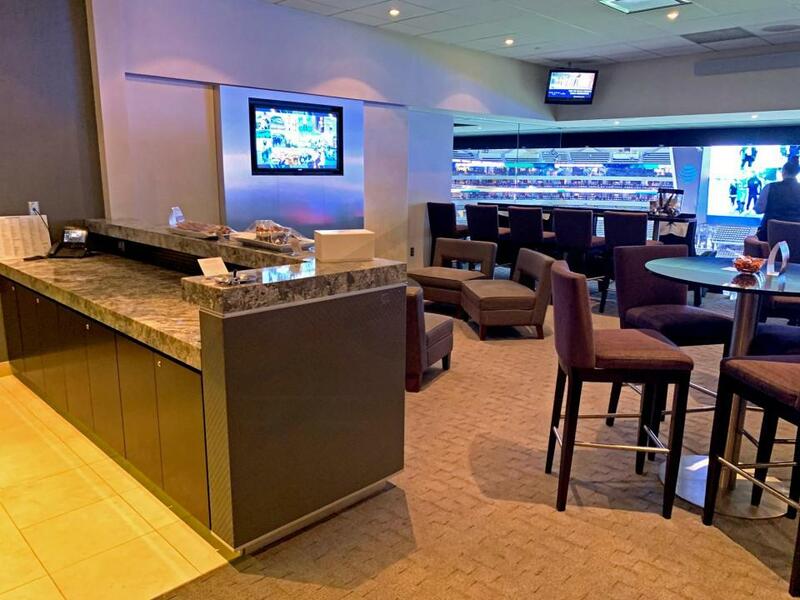 American Airlines Silver Club and Sony Silver Club – located on the silver suite level, these clubs are accessible by suite ticket holders on the Silver Level, Ring of Honor Level, and Star Level. You must purchase your own food and drinks in this club. 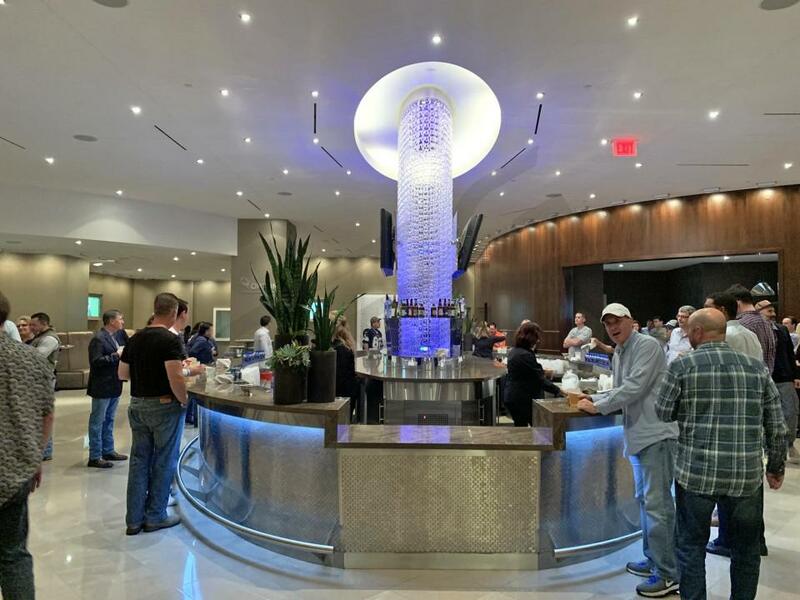 Optum Club – located on the north side of the Hall of Fame suite level, this is one of the most exclusive clubs at AT&T Stadium. Only certain Hall of Fame suite owners have access. 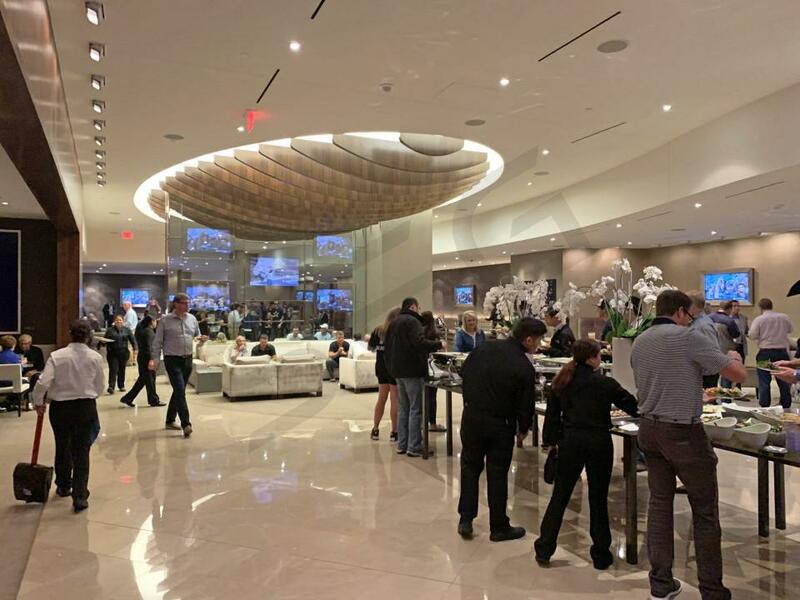 The club has striking décor, but the highlight is the all-inclusive food and beverage offering, including beer and wine. If you have a Hall of Fame suite ticket with Legends Club access, you can eat in the club, or bring the food and drinks back to your suite. 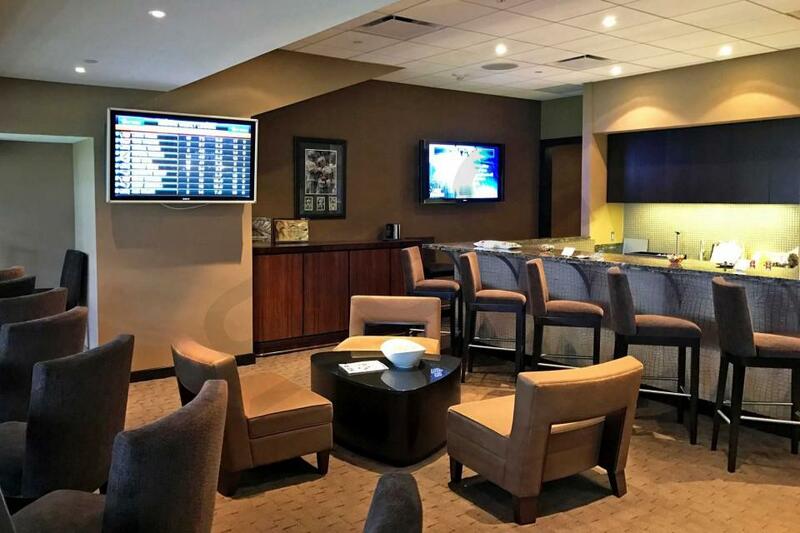 Owners Club – Located on the Hall of Fame Level, there are only a handful of “Owners Suites” that provide access to the Owner’s Club. Like the Legends Club, this club is heavily guarded by security and provides all you can eat food and drink for the lucky few who gain admittance. 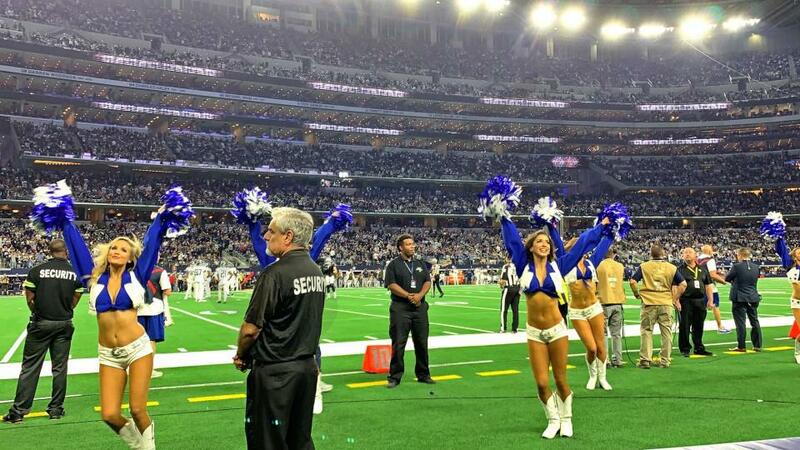 Once inside, if you’re lucky, you might even get a sighting of team owner Jerry Jones. 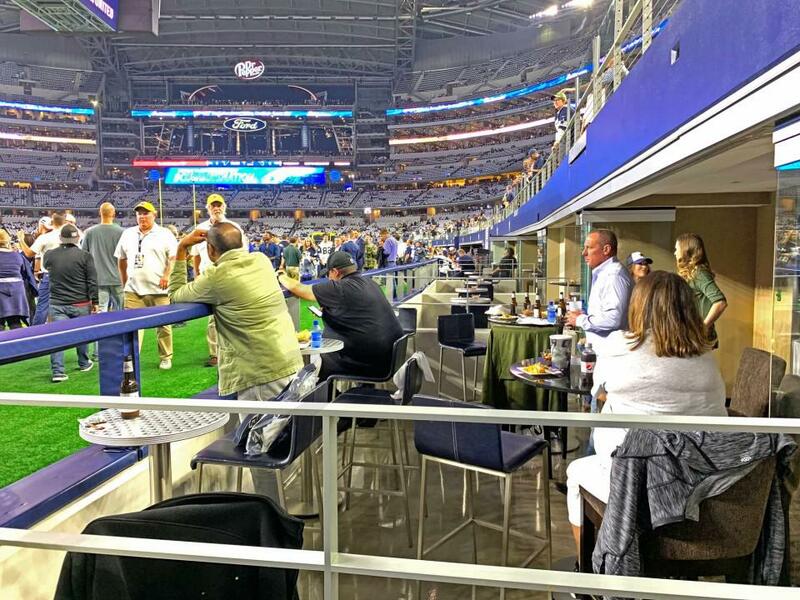 Draft Kings Club (formerly Miller Lite Club) – the most unique club at AT&T Stadium is located at field level and allows you to stand just a few feet away as the players enter and exit the field. This club is accessible to only Field Suite ticket holders. Food and drink is available for purchase. There are also a few smaller lounges on the Silver Level, including the Patron Platinum Lounge and Dee Lincoln’s Tasting Room & Bubble Bar. The Platinum Lounge even includes an outdoor patio where you can get some fresh air after a big play. When you purchase a suite, the best lounge of all is always the privacy of your own luxury suite. However, it’s an added bonus to have access to other parts of the stadium, often populated by movers and shakers from Dallas and beyond. There is limited space for meetings and conferences on game day. 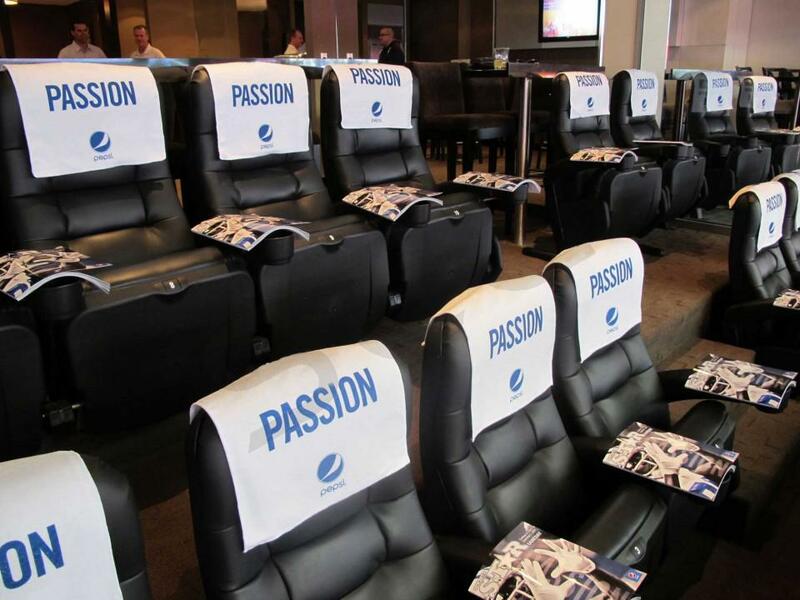 Some guests choose to give a short presentation in their suite before the game. You can connect a laptop to the TVs in the suite via HDMI cable. There is no right answer here, and it ultimately boils down to what others in your group will be wearing. If it’s a corporate event, many guests will likely be dressed in business casual attire. However, it’s not uncommon for guests to wear jerseys of their favorite player, jeans, or even shorts on a hot day. 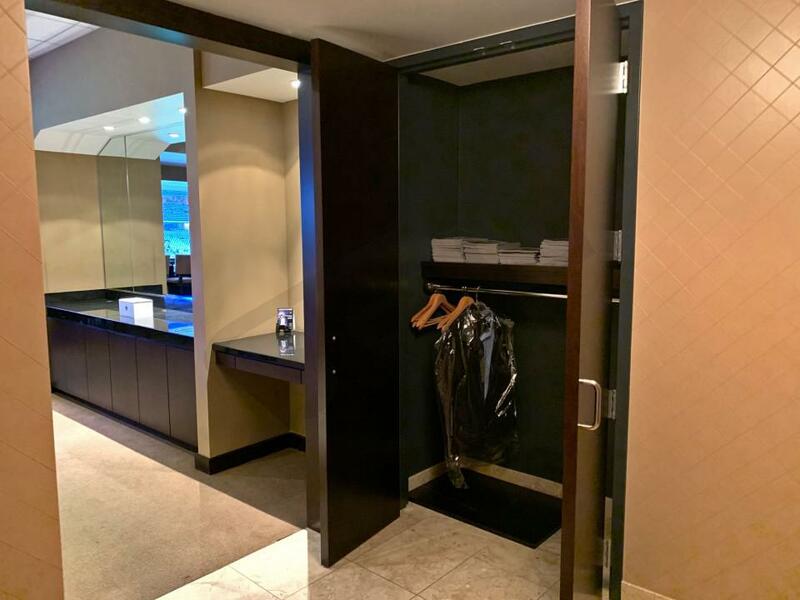 Luxury suites at AT&T Stadium are climate controlled and have a coat closet for storage. The NFL has implemented a policy that patrons must bring all their items in bags that are clear plastic, vinyl or PVC and do not exceed 12" x 6" x 12." Read the full policy here. Children under the age of 1 will not require a suite ticket to enter the stadium. Strollers are permitted at AT&T Stadium. 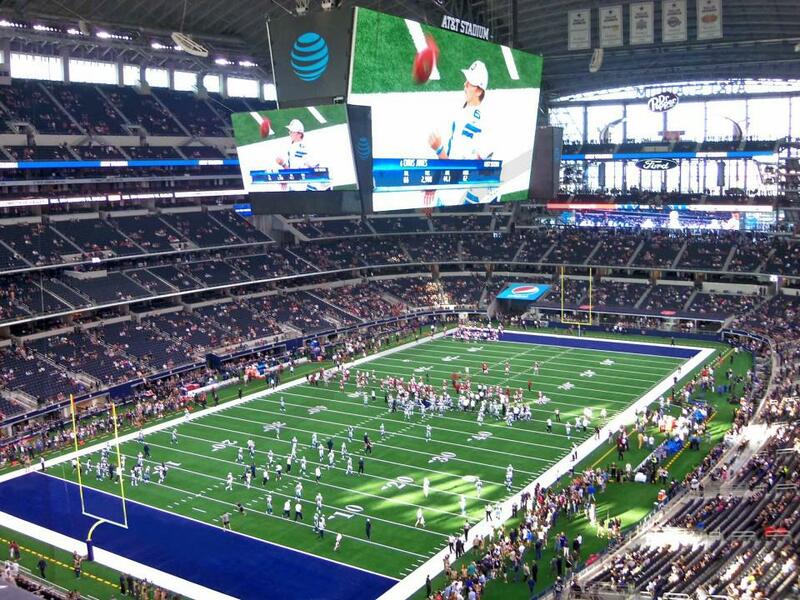 AT&T Stadium has 15 parking lots in total. 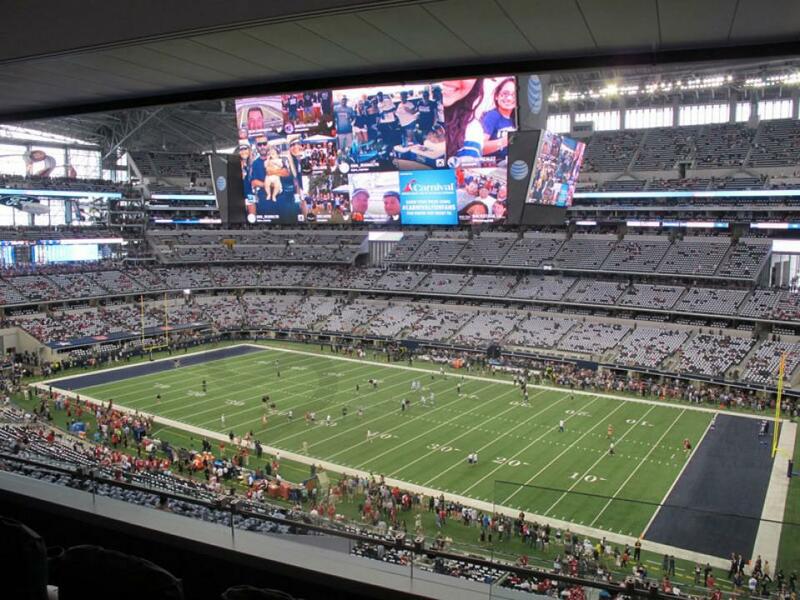 Suites at AT&T Stadium will come with parking passes valid in designated VIP lots. You can follow the directions on those passes to identify the best entrance for your particular suite. Larger groups wishing to travel to the stadium together often opt for a bus. Busses and RV's (oversized vehicles) can park in Lot 14 with a valid RV pass ($150). AT&T Stadium has two designated passenger drop-off zones at Lot 1 and Lot 6. 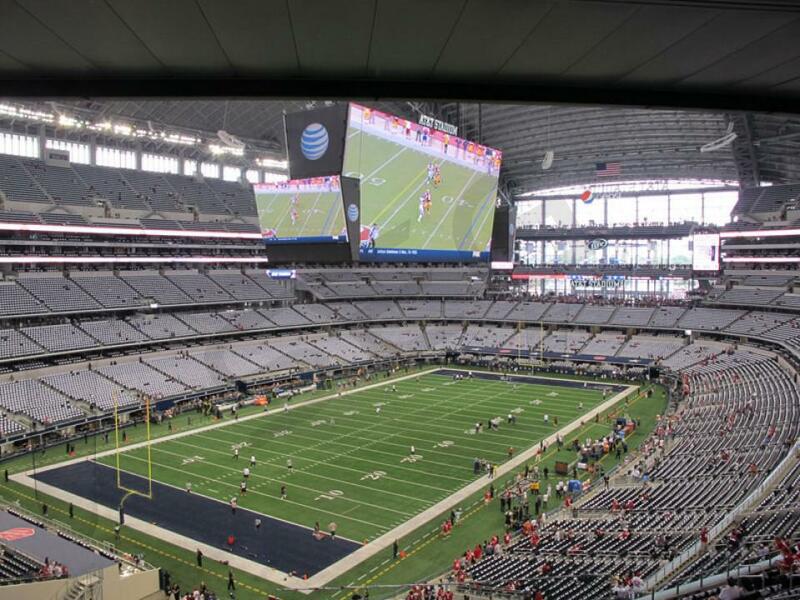 Parking lots typically open 5 hours in advance of Cowboys games. Stadium gates will open 2 hours before kick-off for suite ticket-holders. This is generally the case for other events at AT&T Stadium as well. VIP Entrances are located at A, E, F, and K gates. The 2018 Big 12 Championship is taking place at AT&T Stadium on December 1, 2018. 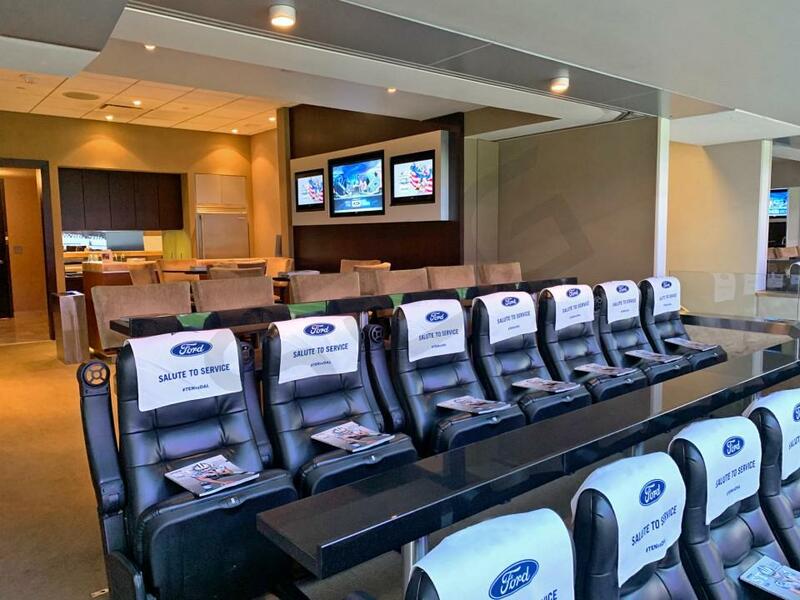 This is a popular event for renting a luxury suite as it will attract fans from all over the country. 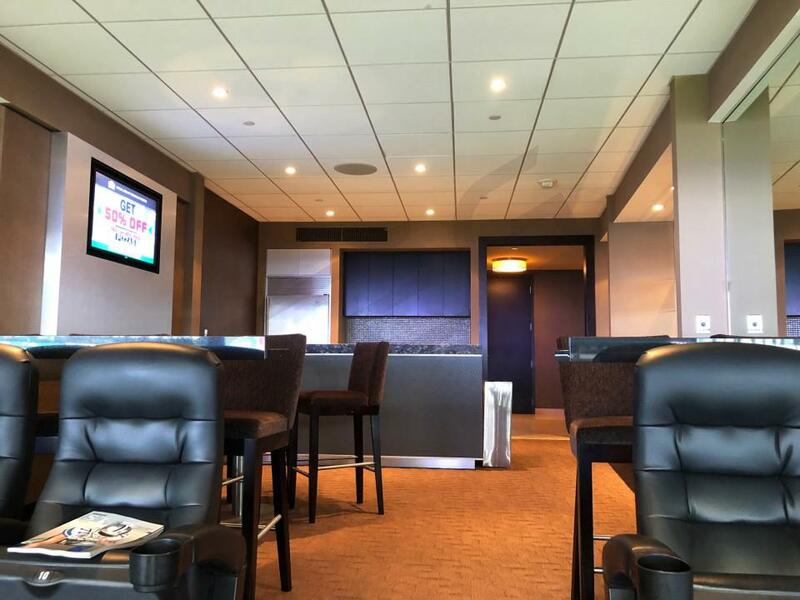 Suites for the Big 12 Championship are going to vary in price based on which teams are playing and the suite location. Luxury boxes are going to hold 18 – 30 people on average and can be priced around $11,000 - $35,000 for the Big 12 Championship. Star Level and Field Level suites tend to be the less expensive options, while Hall of Fame suites are going to be the most expensive. The top teams in the Big 12 Conference are Oklahoma, Texas, West Virginia and Iowa State. The most popular matchup would be the Oklahoma Sooners vs. the Texas Longhorns. Renting a suite for just this event is easy to do through Suite Experience Group. An SEG rep will follow up with your purchase to help you with In-suite catering to make sure your suite is fully stocked with your favorite foods and drinks. 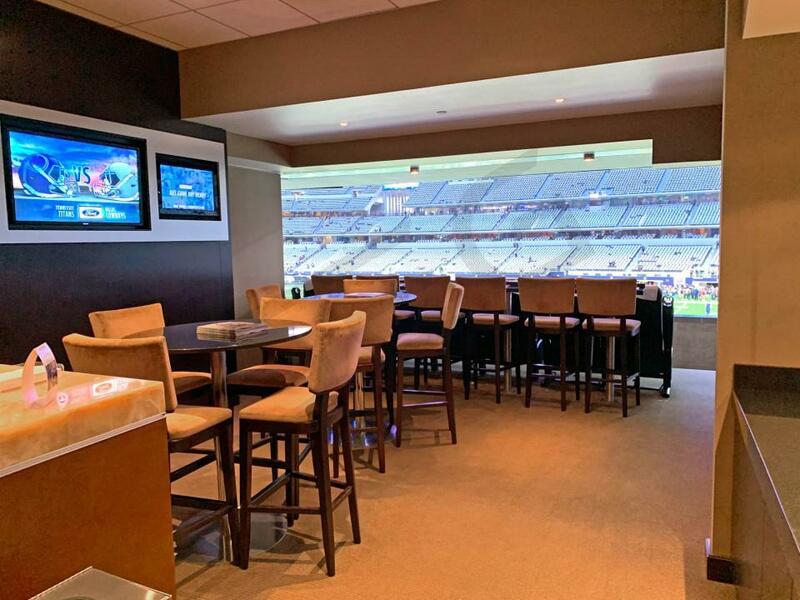 Enjoy the Big 12 Championship game at AT&T Stadium in a suite. Thank you for signing up for specials at AT&T Stadium. Enter your email address below to stay in touch. We'll sign you up for our newsletter, which will inform you of the latest inventory and events at AT&T Stadium. We promise we will never sell or distribute your information. 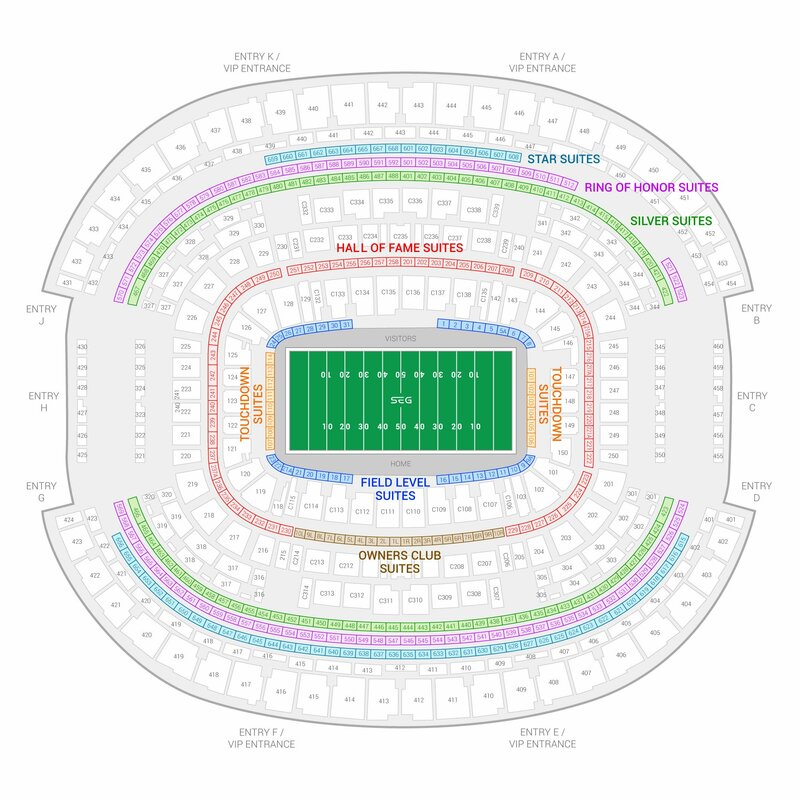 The seating chart below shows where the Big 12 Football Championship Game suites at AT&T Stadium are located.